Atheodox Jew: Do You Believe in Extraterrestrial Abduction? Do you raise your children to believe that E.T. 's exist? If yes, how can you convey sincerity when they ask certain questions about E.T. 's that require answers which you don't actually believe are true? Do you raise your children to believe that E.T. 's exist? I'd say we live in a fairly "Hashem-neutral" home. Meaning my wife and I don't talk about Hashem - what Hashem wants from us, how Hashem did this or that, etc. When I give divrei Torah, it's very "light" on Hashem-talk except where it directly relates to psukim in the Torah. So by osmosis, without our saying anything either way, the kids get a version of Torah that focuses on the *content*, not any supernatural/miracle-talk. If yes, how can you convey sincerity when they ask certain questions about E.T. 's that require answers which you don't actually believe are true? Depends on age. Younger ones use more Hashem-talk - I see it as compatible with a healthy imagination and fantasy life. So if it comes in the form of a question, I answer them on their terms. But in my experience, the Hashem-talk tapers off as they get older. And for the occasional question that comes up, I just try to reframe it/redirect it in rational, human terms. I can't remember feeling insincere with my kids. You never know who's going leave, who's going to stay, or who's going to return - no matter what you do. Different kids have different natures, different experiences. So it's never a given. All we can do is present a Torah/Judaism that's vibrant, healthy, rational, enjoyable, meaningful, idealistic, giving them a strong educational basis, and let them make the final choice. And even then, much of it has *nothing* to do with Torah per se - it's whether they have positive memories of home and growing up. If so, they're much more likely to want to recreate that in their own lives. Just to know, the dialogue isn't completely autobiographical. I didn't grow up religious. I also want to give a general caveat: I can't possibly say that what we've done would work for anyone else. This is our family's experience. And yes, so far so good, but I don't know how it's going to turn out in the end. Stay tuned! Would it truly bother you if some of your kids made a conscious decision not to be observant? To violate some commandments (as in the case of an active homosexual male child)? To intermarry someone they truly love - someone who would respect Judaism but not necessarily want to become Jewish? I'm past the point of caring. I'd like to see my kids live happy, productive lives, period. The humanist in me is with you 100%. The Jew in me would like my kids to be connected Jewishly, be enriched by it, be inspired by it, have it be a strong part of their identity and help inform the good work they do in the world. Would I be bothered if they weren't observant at all or intermarried? Honestly, I'd probably be a bit sad about it initially, but I'd fully accept and respect their decision and continue loving them just the same. That said, if it's a choice between a miserable, unfulfilled observant life and a happy, productive secular life - it's not at all a question. Sometimes, though, I wonder what other people (those outside of the E.T. 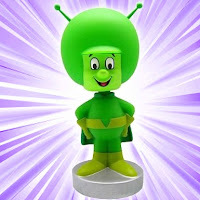 community) think of me when they see me wearing my fuzzy green flying-saucer deflecting skull-cap. "Oh, he's one of those wacko believers in E.T. abduction!" they must think. On the other hand, those inside of the E.T. community who suspect me of not really believing look at me as a pariah for excactly the opposite reason. Bottom line is that some people look at me as a lune, whereas others see me as a heathen. Nowhere am I looked at as "normal". You know what? That's a lousy feeling. some people look at me as a lune, whereas others see me as a heathen. Nowhere am I looked at as "normal". You know what? That's a lousy feeling. So, so true. It is a lousy feeling. I suppose I've created a "bubble" that works. I have a circle of close friends who know where I'm at and who I can feel very "normal" around. And living in Israel walking around with a kippah is par for the course, so I don't often get that "loony" feeling. But I do have a related experience: Nowhere do I feel "at home". Besides my actual home, and this small circle of friends, I live with a distinct sense of not feeling at home anywhere - not in the religious world and not in the secular world. But part of me wonders whether that itself is perhaps a distinctly "Jewish" experience, in the Avraham Avinu sense - the sense of not fitting in with the larger society, not quite being with the program, looking at the world from a slightly different angle. I think that holds the possibility of "chidush" - introducing novel approaches in the world. Of course, that doesn't make it any easier to live with! So I think it's a question of creating a bubble of comfort to help us live with the discomfort. > Nowhere do I feel "at home". Besides my actual home, and this small circle of friends, I live with a distinct sense of not feeling at home anywhere - not in the religious world and not in the secular world. It's a tough position, no getting around that. Regarding the last thing you mentioned though, have you tried interacting more with non-frum people? I’ve been reading Eric Hoffer a bit lately – he has a book about the “True Believer.” He says a lot of things in there, but one impression he left on me was that the true believer who joins a mass movement (religious or secular) is someone who carries around a dissatisfaction with society. Maybe feels unconsciously overlooked, unimportant, unresolved. Doesn’t see society as a way to achieve that important feeling of wholeness. Among other things. It got me wondering whether those who stayed frum, and those who become frum, have some of this – alienation, angst, anger, frustration. And then of course they marry and just genetically pass on to a high proportion of kids a kind of alienation with the world, particularly the outside world. In a way, they may feel it with their own world as well, but of course to a much lesser extent. It feels very Jewish to me to look around and feel something is wrong. It may be also be a factor in the Jewish world turning more to the right. Alienated and unhappy, they look to find a truer experience even more removed from the world. Thanks for introducing me to another writer/thinker - I hadn't heard of Eric Hoffer. Just from what I gleaned from his Wiki page... In "True Believer" he apparently speaks about Nazis becoming Communists and vice-versa - this is a good point. I often think when I see someone who's highly opinionated that it's the "opinionatedness" which is the ikar (main thing), and the particular opinion they're espousing is really almost incidental. If their life-circumstances were slightly different they'd be arguing the exact opposite opinion with equal fervor! It strikes me that there's a significant difference between leaders like Hitler, whom Hoffer describes as not only alienated but angry, and people who follow such leaders or seek to join any mass movement. Alienation from and/or dissatisfaction with society (or family) might be one reason that people join such movements. But there can be other reasons as well - the desire for meaning and purpose, for friends, community. And the alienation can also be "learned alienation", in the sense that the group indoctrinates people with the idea that there's something wrong that the group aims to correct. When I became frum, the idea of a tight community with people looking out for one another was a strong attractor. I was always reticent to be identified with any group, and it was nice to "let go" and allow myself to align with a group I felt an affinity toward. Also a factor was the sense of idealism I had about "Mashiach" and the idea of creating a better future. (And no, I didn't become frum through Chabad!) The whole Mashiach concept for sure presupposes that something is wrong with the world - though I have to say I think that's a perfectly rational presupposition! And moreover, I was anything but "angry". Neither was I lost or depressed, or even looking for something. I simply "happened upon" Torah Judaism. I liked what I saw and wanted to learn more, and I eventually became frum. Of course that's just me, but point being I think it might be an incorrect generalization to say that people necessarily become frum out of things like alienation, anger, etc. (though no doubt though there are some who do). As far as "staying frum" - I'd say that far and away the biggest factor is INERTIA. You make a life choice, start to dig in your heels in terms of identity, friends, family and community. It's not an easy thing to leave even if you're single and a ba'al teshuva - all the more so if you're FFB and/or married with kids. Now it's definitely true (even take G*3's comment above as an example) that when you're raised in the system, you can't help but come away with a profound sense of alienation from the outside world. It's driven into people ideologically, at school and at shul, nearly every time you pick up a sefer. And even if you weren't taught to fear or dislike the non-frum world, there's the simple fact of "being" different - not eating in the same places, not wearing the same clothes, not partaking in the same cultural experiences. And of course there's antisemitism. However... We're mistaken if we think we're the only ones who feel alienated. Just focusing on the U.S., I'd say MOST people probably feel alienated. Blacks do. Latinos do. Poor people do. Even rich people feel different. Anyone with a disability does. Jews do. Muslims do. Christians feel under attack. Atheists feel under attack, and on and on. So it seems to me the question is what do you DO with that feeling? Do you let it develop into full-fledged paranoia and adopt a siege mentality? Do you use it to play the "victim" card? Do you teach your children a seething dislike for anyone outside the group? A good chunk of the Charedi world seems to have taken this route, as have other groups to various extents. Or... Do you leverage the feeling of alienation to stay "sharp" and not get lulled into unconsciousness by the surrounding society? Do you use it to create art? Comedy? Tell stories? Do you use it to educate, pioneer and forge new paths, fight for justice, say YES when everyone else says no (or NO when everyone says yes)? Do you use it to try to make a difference in the world? That's what I think we should do - and honestly that's what makes me so proud to be Jewish, because I think in large part we HAVE done that. Hmm, all that and I'm not even sure I properly answered your question. Well, I tried at any rate! This goes back to the Pasta Monster parody. Look, it's not the belief but the consequences of that belief that matter. If I change my beliefs and say that while I accept that God exists I now deny Matan Torah then my whole life changes (lots more free time, for one thing). If I change my beliefs and think that aliens are abducting people, well that doesn't change much of my daily life. It doesn't change my sense of ethics. It doesn't change my moral focus. So the two situations simply aren't the same.